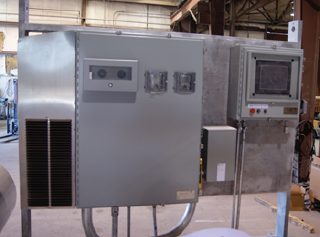 State-of-the-art control systems with or without custom HMI touch screens. 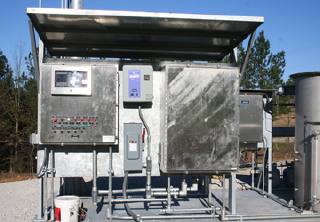 Parnel Biogas systems require many different types of controls and control interfaces. Controls are for: ignition, monitoring of flare system operation, control of fluid levels in the knockout drum, gas and combustion air blowers, flame and flash-back detection, measurement and recording of process gas make-up, adjustment of assist gas injection if needed, adjustment of blower speed, temperature control, purging systems, staging controls, pump packages, etc. Parnel Biogas has personnel that have expertise and extensive experience in the design, application and implementation of all types of control systems. Optionally available communications interfaces can pass control and function information via wireless communication from most any remote location. This equipment is also capable of remotely controlling and /or reporting field production, remote trouble shooting, and system process changes and data acquisition. Battery backup options are available to insure constant operation of the control system, in areas where electricity is not available or is unreliable.